At Camino, we’re obviously in love with Spain, so each year we organise two or three staff trips to explore the different regions and discover the amazing produce the country has to offer. It’s also a great opportunity for us to meet our suppliers and bond over delicious tapas and a glass of vino or two. Cinco Jotas is the premium brand of jamón that is sold in all of our restaurants. 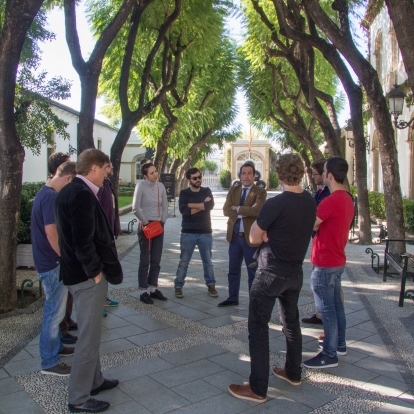 In November, they were kind enough to invite us to Seville and its surrounding areas to visit their incredible pig farms and delve into the cellar of their extraordinary winery at Bodega Osborne. 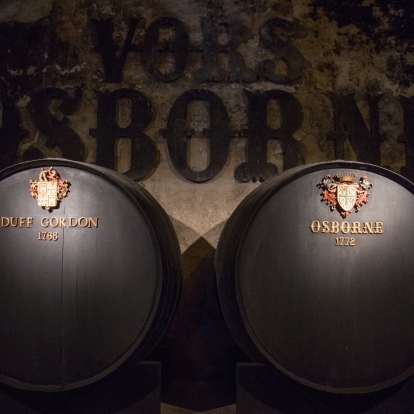 Soon after landing in Seville, we were whisked away to visit the bodegas of Osborne, a Spanish family business with over 200 years of history. 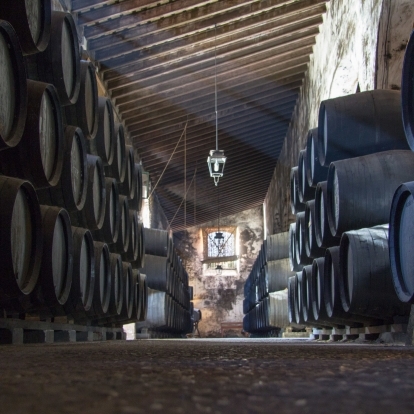 Within the sherry triangle, that is formed by the towns of Jerez de la Frontera, Sanlucar de Barrameda and El Puerto de Santa Maria, lies the bodega itself, consisting of numerous ancient buildings that lie within beautifully pruned gardens. Upon arrival we were welcomed by our tour guide for the afternoon, Ivan, who gave us an introduction to the history of Bodega Osborne. Without wasting a second more he lead us through a corridor of towering trees that gave way to a catherdral-like abode where we’d be sampling the finest sherries the area has to offer. Upon entering the cellars we were greeted by the most amazing aroma of ageing wine. Once our eyes adjusted to the darkness, barrel upon barrel filled the vast space, stretching from wall to wall, floor to ceiling. 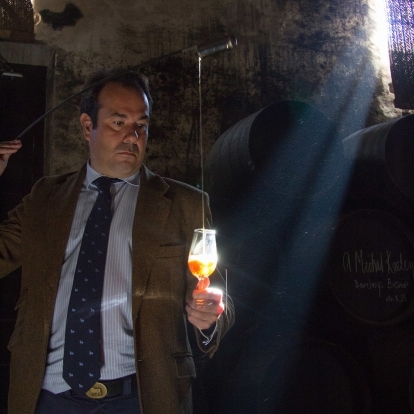 We were each dealt a glass and began to taste, starting with a fino, and working through the sherries from light to heavy. A series of delicious manzanillas, amontillados, and olorosos were handed to us, dating back to as early as the mid 1800’s. Each having their own unique characteristics, but all tasting out of this world. Before the alcohol kicked in, it was time for us to feast at their restaurant next door where we were treated to course upon course of authentic Andalusian tapas. The following morning we quickly had to shake off the symptoms of a sherry hangover and get back on the road, this time in search of the legendary Ibérico pig. 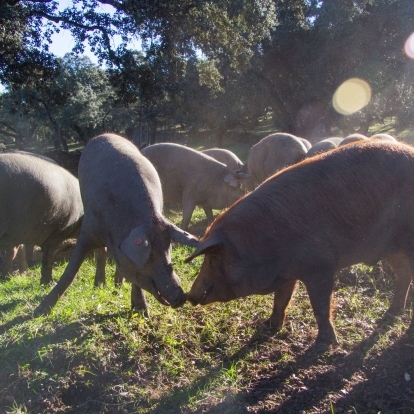 Our hosts, Javier and Angel, drove us into the hills of the Andalusian countryside where the woodlands of the southwest peninsular guarantee the best diet for Cinco Jotas 100% Ibérico pigs. We arrived at the gates of pig heaven and left the vehicles to make our way down a winding path towards the farm house, where we caught a glimpse of what we’d come looking for. Pig expert, Marco, invited us into the “pen” (or should I say paradise) where exactly 400 pigs roamed freely in acres of lush woodland sniffing out their favourite food, sweet acorns that fall from the densely populated holm oak trees above. The residents were unbelievably tame, inquisitive in sniffing out intruders in the hope of becoming new best friends. Some lay in groups basking in the sun, whilst others seemed to fool around with one another, creeping up on their pals to scare them from behind, sniggering as they ran away. 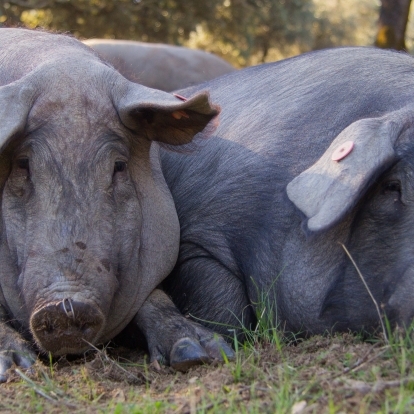 These were literally the happiest pigs on earth, and we began to find out why. Each pig gets the equivalent of an entire hectare to itself, where it can walk up to 14km per day foraging for acorns as well as a variety of other delicious treats that are on offer. They live free range between 18-22 months until they are big enough to be transported to the town Jabugo where they are individually subjected to a fast-acting CO2, putting them gently to sleep before they are ‘sacrificed’. 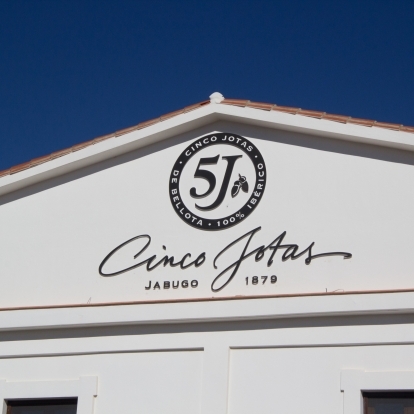 Cinco Jotas traditionally cure all their meats under one roof and have been doing it the exact same way for centuries, using completely organic and natural conditions. 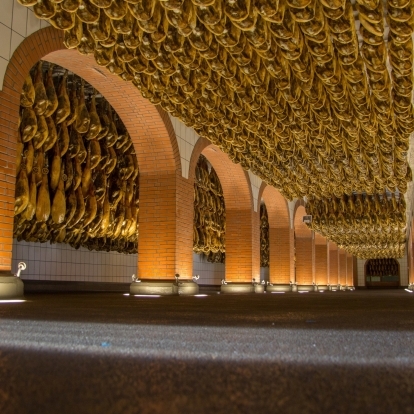 We were invited on a tour around their ancient cellars where we were left speechless at the sight of a truly remarkable vault of hanging jamon legs. Once we explored the rest of the lower quarters, we were taken back above ground to taste the legend itself, and it didn’t disappoint.